FOR DISTRIBUTION OUTSIDE THE USA. From master storyteller Walter Wangerin, Jr. comes this familiar biblical saga told in a fresh, transfixing way. You'll feel you've never heard it before! Melding historical accuracy with imaginative detail, Wangerin uses the biblical books of Judges and Ruth to explore themes of love, faith, grief and community set against a backdrop of war and political instability. The widow Naomi grieves the deaths of her two adult sons after the shocking murder of a beloved adopted daughter, while pondering her responsibilities toward her Moabite daughters-in-law. Ancient Israel is in chaos. When her daughter-in-law, Ruth, begs to return to Israel with Naomi, events are set in motion that will change the course of history. But wait...this isn't the tame, flannel graph story you heard in Sunday School. In the tradition of Anita Diamant's The Red Tent and Elissa Elliott's Eve: A Novel of the First Woman, Wangerin imbues his tale with strong female characters and an earthy realism that gives the timeless Old Testament narrative so much power. You'll find echoes of contemporary issues throughout: deceit, heartbreak, loss, war, and, of course, the power of love. 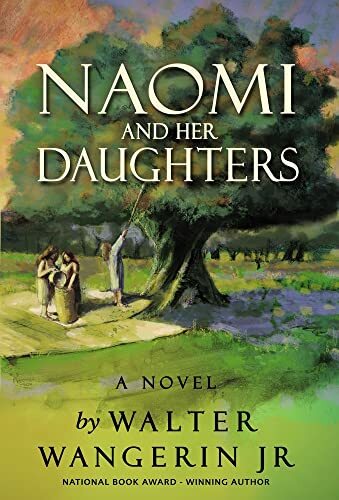 Naomi's combined strength and tenderness becomes the pivot upon which a nation turns; her decisions ultimately lead to the founding of the family lineage of Jesus Christ. Breathtaking descriptions, shocking violence, and inspirational courage make this spellbinding novel by a beloved award-winning author a story you won't soon forget. It's the perfect novel for your book group, and a satisfying read for those who love thoughtful biblical fiction. Walter Wangerin Jr. is widely recognized as one of the most gifted writers writing today on the issues of faith and spirituality. Starting with the renowned Book of the Dun Cow, Wangerin's writing career has encompassed most every genre: fiction, essay, short story, children's story, meditation, and biblical exposition. His writing voice is immediately recognizable, and his fans number in the millions. The author of over forty books, Wangerin has won the National Book Award, New York Times Best Children's Book of the Year Award, and several Gold Medallions, including best-fiction awards for both The Book of God and Paul: A Novel. He lives in Valparaiso, Indiana, where he is Senior Research Professor at Valparaiso University. Walter Wangerin Jr. es reconocido como uno del mejor escritor sobre las aplicaciones la fe y la espiritualidad. Su libros incluyen The Book of God [El libro de Dios], Reliving the Pasion [Recuerdo de la Pasion], Peter's First Easter [El Primer Domigo de Resureccionde Pedro], Mourning into Dancing [Como Cambiar el Lamento en Baile], The Manger is Empty [El Pesebre Vacio] y Little Lamb, Who Made Thee? [ Quien te hizo, Corderito?]. Wangerin vive en Valparaiso, Indiana, ocupa la catedra Jochum en la Universidad de Valparaiso, donde es escritor residente.